ISBN 149501021X. 9x12 inches. Compiled and edited by Richard Walters. Contents: Bartók: Peasant Song from Ten Easy Pieces • selections from The First Term at the Piano: Stepping Stones, Invention I, Parallel Lines, Legato and Staccato, Dialogue I, Dialogue II, Dialogue III, Follow the Leader, Short and Long Legato • Kabalevsky: selectionsfrom 24 Pieces for Children, Op. 39: Melody, Polka, Rambling, Cradle Song, Playing, Funny Event, Song, A Little Dance, Scherzo • selections from 35 Easy Pieces, Op. 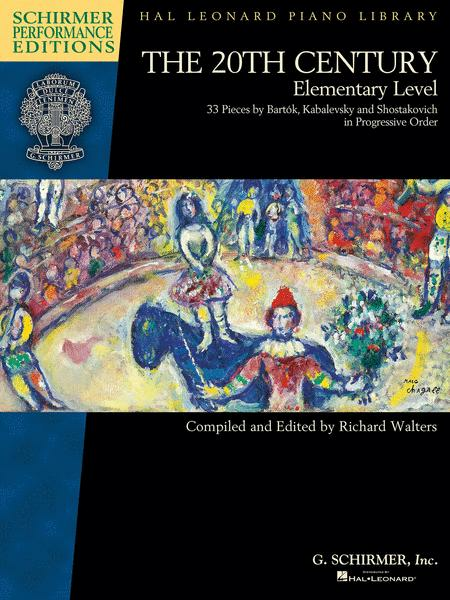 89: First Piece, First Etude, Quiet Song, At Recess, First Waltz, Light and Shadow, Little Hedgehog, Playful One, Trumpet and Echo, Evening Song, Skipping Rope, Trumpet and Drum • Shostakovich: selections from • Children's Notebook for Piano, Op. 69: March, Waltz. Schirmer Performance Editions feature composer biographies, historical notes, and practice and performance tips.